Revolutionary new cane base allows almost any cane to become self-standing on a variety of flat surfaces. Features a flexible traction design that cushions the impact of everyday cane use through hands, wrists and elbows. Lightweight and easy to use, especially on stairs. Provides an alternative to using a quad cane. The patented AbleTripod® easily replaces your cane tip. Print this image to find which size Able Tripod fits your cane! Dimensions: 4 1/2" x 4 5/16"
The ergonomically designed AbleTripod® weighs 8 ounces and makes your cane self-standing, providing maximum stability and function to your cane. Composed of a durable, specially weighted rubber compound, great care was taken to control the right amount of flexibility, giving the base its remarkable performance. Stairs are now easily managed. Quad canes need to be turned sideways on stairs, making the user uncomfortable and in some cases fearful. The AbleTripod® gives the user confidence to negotiate even the narrowest steps. The stress of impact on the user's hand is greatly reduced by the AbleTripod, which flexes as you walk. The tips of the pods flex, grabbing while permitting the AbleTripod to roll through, maintaining contact with the ground. The stability of the AbleTripod base is not compromised whether on grass, gravel or sand, whereas typical canes may sink into the ground. "Great for walking on the beach!" AbleTripod can be used in ways that no other cane can: its unique design enables the user to lean into the cane, experiencing both support and balance. The ability to lateralize gives the user a unique feeling of confidence, knowing that the AbleTripod® is less likely to slip out than quad canes. AbleTripod is now being used to assist individuals with neurological and orthopedic disorders. 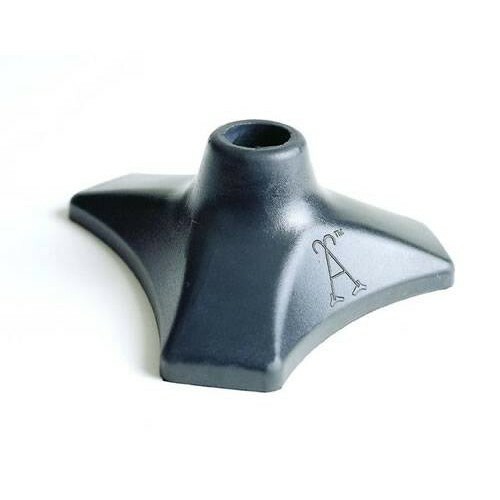 Individuals with post-stroke balance disorders, MS, Parkinson's, cerebral palsy, arthritis, post hip and knee surgery and amputees have all benefited by using the AbleTripod. The AbleTripod has been recommended by physicians, Physical Therapists nationwide. 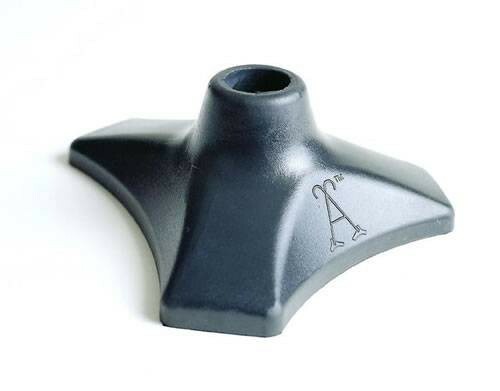 The aesthetically pleasing design enables both left and right-handed people to use the same cane without adjustment.The AbleTripod® is currently being used at several University Hospitals and Rehabilitation Centers and is available in 5 different diameters to accommodate different shaft sizes. I've used these for years. Love them. Add to the quality of my mobility impaired life. Using a cane makes you one-handed. This tip allows you to stand and use both hands. It also allows you to pop your cane right back up to you if it has fallen over. Love the tip. Easy to install and works great. Quality of product is excellent. The cane tip is very helpful, and I recommend it. However, I ordered 2, and received only one. I had to return a tip which I had ordered in an incorrect size, and once i got the return instructions, the return went smoothly. I would still like the second tip that I ordered, but which was not shipped. 7/8 inch tripod tips raised rubber surfaces just seem to wear down too fast needing me to buy a new one at least every 6 or less months because when it starts falling over it causes me back pain to have to reach over to pick it up. Also shipping needs to pay more attention to orders and send not only the correct number of tips ordered but the correct size as well. I am still waiting on the prepaid shipping label to return the wrong size they sent me. A wonderful idea, which has helped my wife considerably from the old "long cane" concept. It's got tight feet, and does the job of more extravagant cane alternatives. Will be ordering another one shortly. I purchased this item for my Mom , whose cane is forever falling on the floor. She was initially reluctant and thought the tripod base would be too heavy and cause her to trip. Within a day or two of using it, she loves it. Her friends all ask where she got it. I must stress, however, that it is vitally important to order the correct size base for the cane for which it is intended. Incidentally, the base does not interfere with the maneuverability of the cane and is not too heavy. We are all very pleased with this product. Tripod cane did not fit, called customer care to return an they wanted to charge me a 20percent restocking fee plus return postage which is more than the item cospast in the first place needlest to say I will never order again. Wonderful product. Bad service from Vitality Medical. The product itself is wonderful. The service from Vitality Medical leaves a lot to be desired. I ordered twelve tripod cane tips and paid for them in November and as of January 26th 2012 I have not received them. Two months if too long to wait.